In the first half of 2015, social engagement for the average U.S. brand grew 52% year over year across Facebook, Twitter and Instagram. The largest increase in engagement came from Instagram, which grew by 94% from 9.7 billion actions in H1 2014 to 18.8 billion in H1 2015, followed by Twitter at 40% and Facebook at 26%. 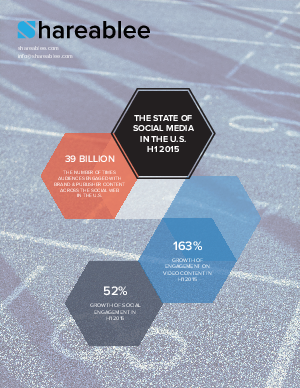 In the State of Social Media U.S. 2015 Fact Book, Shareablee unpacks this social growth and examines which categories and brands are capturing the largest share across the social web. If you want to take a deep-dive look into the U.S. top performers dominating on social, you won't want to miss this book.